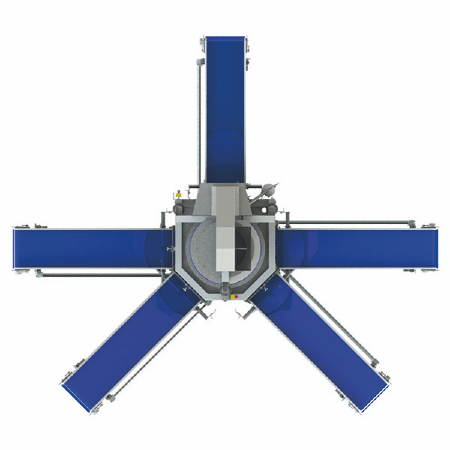 Depending on consistency, shape and size of the product and the desired degree of drying, spinning times and spinning speeds can be adjusted via a touch screen and saved in the programs. Depending on the cycle time and rotational speed, some parameters are automated, e.g. speed of the buffer conveyor and of the outfeed conveyor. Thus, the program is clearly organised and easy to operate. With an optional volume control, the product feed quantity can be optimised. This influences the capacity and the drying effect. In addition, without product the machine switches to energy saving mode automatically. Production sequence:After the washing process, the product is collected on a buffer conveyor depending on the spinning time, and afterwards it is dried in the centrifuge. According to the product and quantity different programs can be chosen. This enables an effective, gentle and short drying cycle. At the end of the drying cycle the rotational speed is reduced and through one-time blow-off, the product is gently further routed out of the centrifuge and onto an outfeed conveyor. 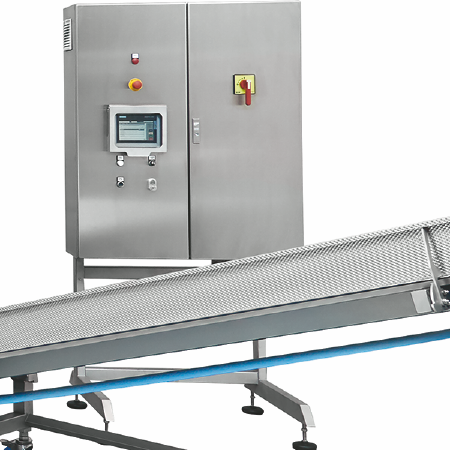 The outfeed conveyor is cycled in such a manner that a product flow that is as uniform as possible occurs for the downstream processes (including weighing / packing). 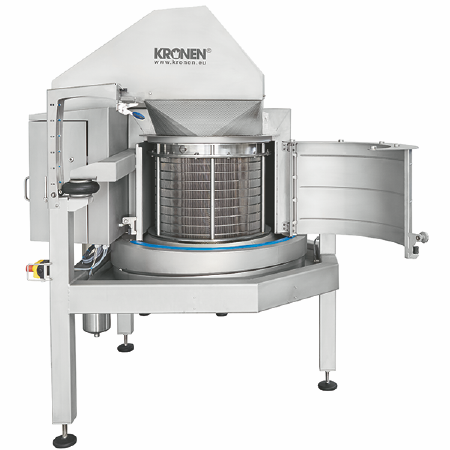 The K650 drying system is an ideal supplement to the KRONEN GEWA washing machines and it can be integrated in all other systems that require a continuous, user-friendly drying process operated with a minimum number of personnel. In the movable control cabinet there is a touch panel in which the appropriate programs can be quite easily entered, modified and saved. The important parameters include the spinning speed, the spinning duration, and an optionally adjustable right-hand / left-hand rotation mode for large-leaf products. The K650 is manufactured completely of AISI 304 stainless steel or FDA-conformant plastics (all surfaces that come into contact with food). For optimal cleaning and hygiene the seal can be mounted and dismounted without tools. Also for the feed conveyor and buffer conveyor, as well as for the outfeed conveyor the conveyor belts can be quickly and easily taken off through a rapid de-tensioning system. The robust machine has been designed in accordance with the latest hygienic regulations and thus it can be cleaned easily and quickly. The supply of the product can occur from two sides and the outfeed can occur in 5 different directions. Thus, 8 different set-up variants are possible that ensure the greatest possible flexibility depending on the customer requirement.